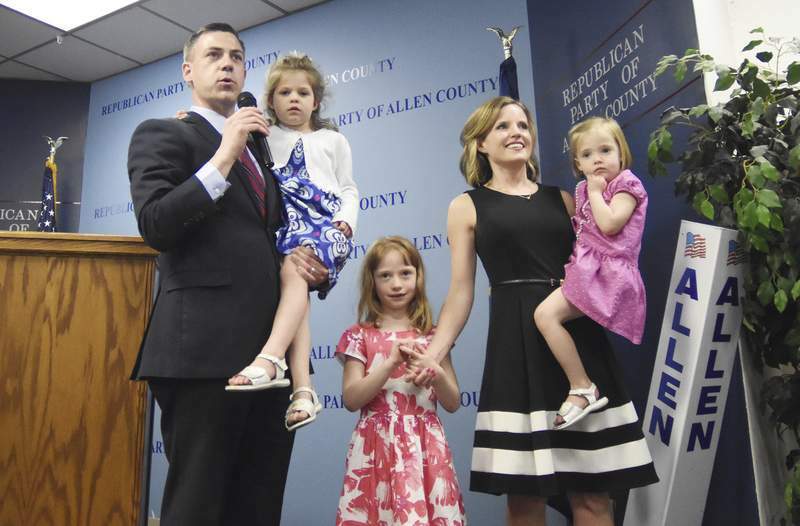 Rachel Von | The Journal Gazette State Senator Jim Banks gives a speech while standing with his wife, Amanda, and daughters at Allen County Republican Headquarters on Tuesday. Republican state Sen. Jim Banks managed to separate himself from a field of like-minded conservative congressional candidates in the only place it mattered: the ballot box. Banks won the GOP primary election in northeast Indiana’s 3rd District, receiving about 34 percent of the vote in the six-candidate contest. Kosciusko County farmer Kip Tom finished a close second with 31 percent, followed by state Sen. Liz Brown with 25 percent. Banks carried only four of the counties in the 12-county district, compared with six for Tom and two for Brown. But Banks built wide margins in Whitley and Huntington counties, which are in his state Senate district, and he beat Tom by nearly 3,700 votes in Allen County, which was won by Brown. Banks said doing well in Allen County, by far the largest county in the district, "made a big difference" in the results. "We focused the campaign very much on the grass-roots network and structure with coordinators in every county in the district. … I have to point to that as the reason that we were victorious," Banks said. Tom said Banks’ margin in Allen County "was the difference" in the outcome. "The voters of the district have made their decision, and we need to support Sen. Banks this fall," he said. In the Democratic primary, party organization choice Todd Nightenhelser lost to perennial candidate Tommy Schrader, who did not campaign. Schrader received 38 percent of the vote to 32 percent for Nightenhelser and 31 percent for John Forrest Roberson. Banks, 36, a commercial real estate broker from Columbia City, and the unemployed Schrader, a Fort Wayne resident who has run at least eight times for public office, including five tries for the Democratic congressional nomination, will face off in the November general election to replace third-term Rep. Marlin Stutzman, who on Tuesday lost his bid for the Republican nomination for a U.S. Senate seat. A Democrat has not been elected to Congress from Indiana’s 3rd District since 1992. "I don’t take anything for granted," Banks said about his upcoming match with Schrader. "This is the most unusual election cycle in my lifetime and probably in generations." Banks, Tom, Brown and former Wisconsin state senator Pam Galloway, who received 7 percent of the vote, staked out the same ground during their primary election campaigns. Each wanted to repeal the federal health care law, roll back regulations, cut government spending, restrict abortion rights, protect gun rights and ramp up national security. However, Banks success at standing apart from this crowd – his military service, his feel-good TV ads, having his wife, Amanda, and their three young daughters share the spotlight – came as no accident. A former chairman of the Whitley County GOP, the soft-spoken Banks hired a top-notch campaign adviser from Ohio, attracted a truckload of early endorsements and ran an upbeat, biography-driven campaign, letting the independent Club for Growth serve as the attack dog against his opponents. He said he ran "an issues-oriented campaign about moving America forward, and I’m proud that we did that. I don’t know what the difference would have been if we would have gotten in the gutter with some of our opponents, but we worked hard not to do that and kept a positive message. I’m proud of our campaign for doing that." He also won the backing of various right-wing advocacy groups, including the American Conservative Union, Tea Party Patriots, Tea Party Express, Citizens United, the Senate Conservatives Fund and the National Association for Gun Rights. Banks had raked in $850,000 in campaign contributions through Monday. Tom had topped $950,000, including $150,000 he lent his campaign. "I guess what I’m proud of is the majority of the campaign dollars that came in came from individuals," Tom said. "I didn’t have any special interest groups out in Washington supporting my campaign like (Banks) did in a big way. I had the support of the people, and I’m proud of that." Tom, whose family grows corn and soybeans in seven counties in northern Indiana, tried to portray himself as a political outsider who, at 61, did not intend to stay long in Congress if he had been elected. "This is my first campaign, and maybe not my last," he said. In the 2nd District, which includes parts of Kosciusko County, second-term Rep. Jackie Walorkski beat Jeff Petermann in the Republican primary, and retired South Bend police Officer Lynn Coleman defeated Douglas Carpenter in the Democratic primary. Trey Hollingsworth, a multimillionaire transplant from Tennessee, won the GOP nomination in south-central Indiana’s 9th District, defeating state Sen. Erin Houchin and Indiana Attorney General Greg Zoeller.